After Richard died, Annie married Thomas Dolby (a widower with his own children) in 1899. By 1901 they were at Row Farm, Long Bennington. 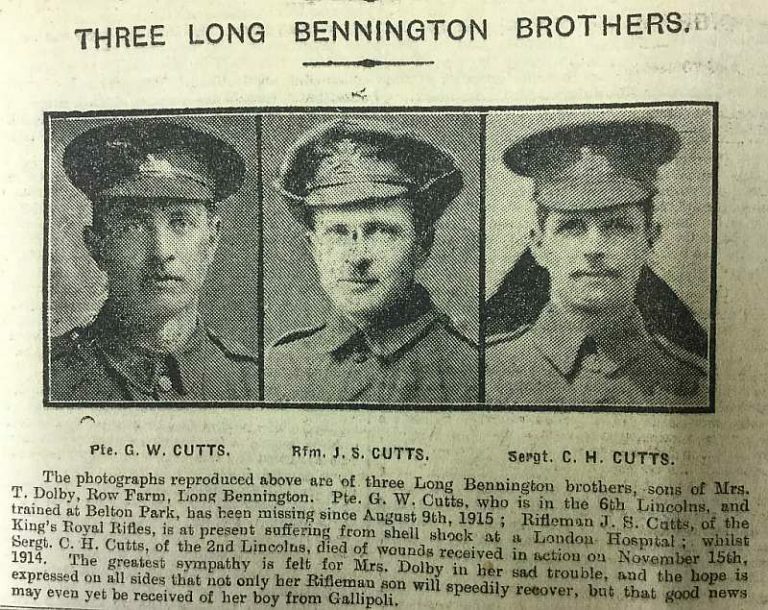 John Singleton Cutts was a farm worker before the Great War. He was in Welby in 1901 and Staunton in 1911. He seems to have joined up at the start of the war and served 13 months in France with Kings Royal Rifles before being sent home with shell shock. He was sent back to the front line but was reported as unfit for trench life and sent to guard German prisoners. In Jan 1918 he surprised his mother by turning up on the door on leave as he had been reported killed. In 1901 Charles Henry was an apprentice to Thomas Parker (baker/grocer /sub-postmaster) at 1 North Parade, Grantham. In 1919 the shop was brought by Alf Roberts, his daughter Margaret (later Thatcher) was born there in 1925. In 1901 the maid at the house was Mary Gardiner Kirton from Long Bennington. Charles must have joined the regular Army before the war as in 1914 he was a sergeant with 1st Battalion Lincolnshire Regiment. He went to the front at the beginning of November 1914 and died of wounds on 15th Nov, during the First Battle of Ypres. His body was not identified and his name is on the Menin Gate in Ypres as well as the Long Bennington war memorial. George William joined 6th Battalion, Lincolnshire Regiment. They trained at Belton Park before sailing to Alexandria on 1 Jul 1915. Then via Mudros to Cape Helles on the Gallipoli peninsula. After 11 days ashore they were withdrawn for a landing further up the coast at Suvla Bay on the night of 6/7th August. On the afternoon of 7th they captured Chocolate Hill at Yilghin Bumu in a bayonet charge. At dawn on 9th August they attacked again but were held up by rifle fire. They dug in until midday but suffered many casualties and were forced to withdraw because of the heat from fires in the dry scrub covering the hill. Realising many wounded men were left behind in the burning scrub, Capt Hansen ran back several times to rescue wounded men, for which he was awarded the Victoria Cross. George was reported missing on 9th Aug and subsequently assumed to have been killed in action. He has no known grave. He is commemorated on the Helles Memorial and the Long Bennington war memorial. Charles Saxelby of Belton (also 6th Lincolnshires) was killed the same day. Thomas Cutts was also home on leave in Jan 1918. He was serving with the Worcestershire Regiment. On May 28th 1918 he was seriously wounded by gunshot in the neck. He was taken to the American Hospital at Rouen, and afterwards to Queen Mary’s Military Hospital, Whalley, Lancashire, where his mother visited him. When the pictures above were published in June 1916 John was in hospital with shell shock, Charles had died in France and George was missing in action.